The reference for competitors, a real weapon for the catwalk! Its unique aluminum frame is not only beautiful to look at, it is also a technical framework with a very accomplished geometry. Aluminium frame, hydro-formed aluminum tubes. 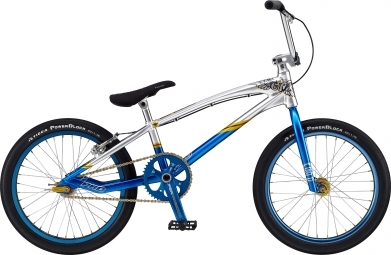 Fork GT, 100% Cr-Mo, pivot 1 1/8 "
Hanger GT race 8 "x28"
GT 2013 BMX Speed Series Pro Bleu clasificado 5.0 de 5 por 1.